Marianne DePierres: Author of the Sentients of Orion Series. Since Mythological times, man has been fascinated with stories and creation of automatons. The Greek god, Hephaestus created mechanical servants, a Greek engineer named Ctesibus created mechanical organs and water clocks back in 270 BC. In Ancient China between 1000-920 B.C. it is claimed that a mechanical engineer created a life-sized automaton shaped like a human as a gift to King Mu of Zhou. The automaton was complete with organs and leather for skin. Robots are nothing new in idea to humanity. In this regard, it seems more like the art of sci-fi imitating life when we read stories and see movies depicting the man-made creations. However, sci-fi has been helpful in stretching the imagination. In 1927, the most stunning science fiction movie (in my opinion) of the early 20th Century premiered in Germany. The movie, “, “Metropolis”, was a brilliant tale ahead of its time. If you’ve never seen this movie, trust me when I say you are missing out on one of the best cinematic masterpieces ever created. I have to say that the first time I saw this movie, I was blown away even more so then when I saw “Star Wars”. Ok, enough of my rambling about that super, awesome, amazing, off the chain movie. Oops, there I go again. Ok, where was I. Oh, yes, movies such as “Metropolis”, and stories such as “The Lost Machine” by John Wyndham, “I,Robot” (the 1938 version by Eando Binder and the venerable master Isaac Asimov in the 1950’s) have engaged the imaginations of robotics engineers for decades. Robotics“. The word “Robot” however, was first used in the 1921 play by Karel Capek titled “R.U.R.” (Rossum’s Universal Robots“; a tale of androids whose rebellion leads to man-kind’s extinction (Yikes). 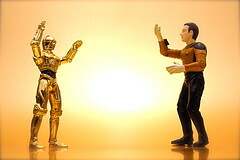 If you’ve ever watched “Star Trek: The Next Generation“, you’ll notice that the character Data has a positronic brain. While fictional, this type of brain is a processor in an android that allows them to have a form of consciousness that is recognized by humans. Such “brains” have also appeared in episodes of “Doctor Who”, “Blade Runner”, and “Bicentennial Man”. As of 2008, researchers at HP Labs have been working on creating a positronic brain. Four years ago, they created the missing fourth Electronic Circuit Element. This new circuit, called a Memristor, or Memory Resistor, rounds out the other three elements which are the inductor, capacitor and resistor. Essentially, the memristor element is what allows a computer to think and process information like a human. Engineers have been working on some of the most interesting new advances in robotics over the past few decades. NASA has a pretty cool astronaut named Robonaut 2. He’s currently stationed on the International Space Station. I saw a documentary on him last year and I have to say, I was impressed. R2, as he’s affectionately known, handles operations in both 1G and 2G environments. R2 can take care of tasks that are too dangerous for humans. Currently, he is legless and attached to a stanchion. 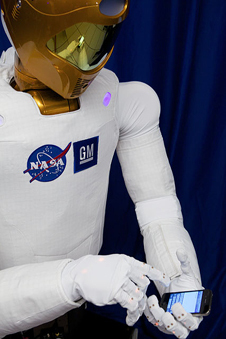 He’s still in the testing stages; however, NASA is working to create a fully functioning robot that will work alongside astronauts, not replace them. I have to wonder, as have so many others, if Asimov had never written about the positronic brain, would we now have scientists and engineers working to create one? Yet again, the imaginations of science fiction authors has inspired research that will bring about something that has the potential to be magnificent. That is, if it’s used properly. I am not looking forward to Skynet taking over. I am a science fiction writer and a poet. It is my pleasure to share my stories with you. Feel free to come hang out as often as you'd like. I love the company!